Fit4Dance Owner Laci Chisholm is honored to be an event host of the Dance/NYC event. The goals of event are to generate support for Dance/NYC and visibility for dance artists based in Brooklyn and to lift up the field as a whole. 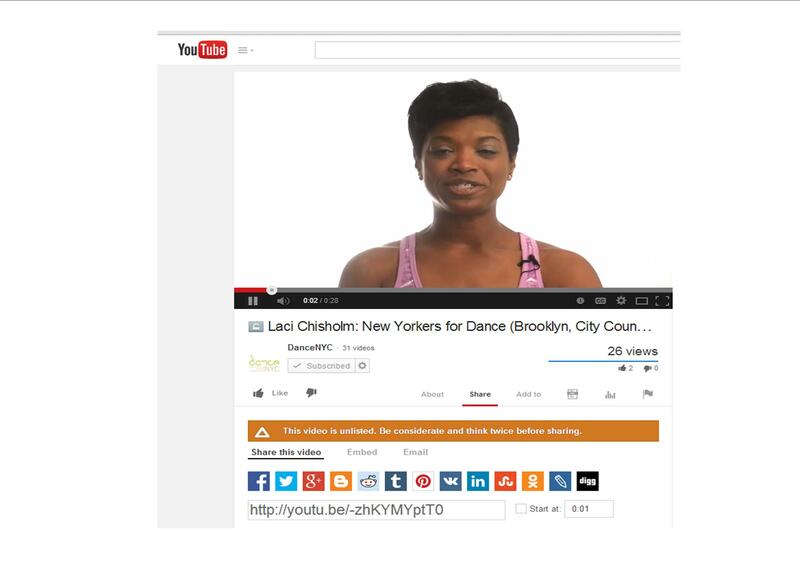 Dance/NYC will use the opportunity to spotlight a Brooklyn edition of the NEW YORKERS FOR DANCE campaign, which has been credited by The New York Times with “Bringing New York City Dance Into the Limelight” and featured video statements from New Yorkers in all 51 City Council districts including owner, Laci Chisholm! Fit 4 Dance is proud of its accomplishments and achievements, but recognizes that it couldn't happen without the love and support of its amazing students, friends, and followers! Here are a just a few highlights from some of the great work we've done. Thank you for making 2015 an amazing year! I can't wait to see what 2016 has in store. Laci Chisholm featured in New Yorker for Dance Campaign!! !